What is a Trackback (also called pingback)? it allows anybody interested in the original post know that you’ve had something to say about it, so it enables the conversation to be followed easily. This can be a good way of getting traffic to your site, particularly if you are linking to a very popular blog. I also think it looks less “spammy” than a comment on the original post saying “I wrote about this today” with a link to your post. Firstly, you should go into “Options” and “Discussion” and ensure you have the following options checked. When you write a post and create a link to a post on another blog (please see Lightening’s How to Link if you’re not sure how) sometimes trackbacks will automatically be issued if there is only one or two. I generally find that if you have more than that, trackbacks will not be issued. In your write post screen, there is a section under the text screen that is titled Trackbacks (depending on the plugins you use there might be other ones as well). Click on the “plus” symbol to open the field. I find it easiest to paste the URLs in this field as I link to each one in my post (or if there are many, paste them into a text editor and paste them in at the end). Just remember to separate each URL with a space. 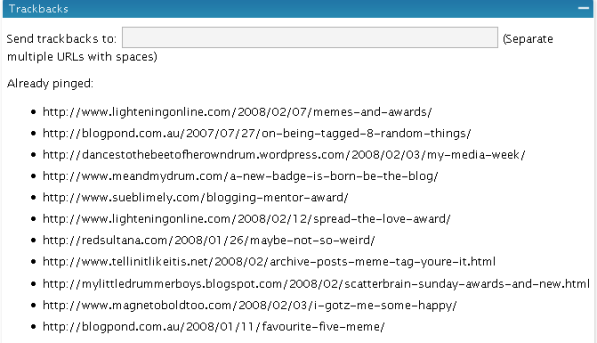 Some blogging platform have special URLs for trackbacks – like Typepad which powers Servant of Chaos. It’s most effective to look for the special trackback link (typically found at the bottom of the post). Well I’ve been travelling along my merry way just hoping this all happens automatically. LOL. I think it’s probably time I checked all of this out. Very helpful post for a newbie blogger like me. Thanks. Lightening and I are in the same boat. I thought it happened automatically, but now I know better that I need to do it manually as you have so eloquently pointed out. This is by far the most easiest explanation I’ve ever seen. You are awesome Meg! I’ve read and re-read multiple times various posts on trackback and pingbacks on so many blogs, but the wording got so confusing that it all became a blur. Thank you! Now I’m going to go back and play a bit with my most recent post and see if I can create this correctly. I’m dancing in my seat right now. Thanks. Very helpful. Unfortunately Blogger does not support trackback, so I thought I would just leave an appreciative comment. thank you for this I was reading about this somewhere but haven’t started to understand why ? Great advice Meg. I will test it on your post. If it works for me ?? ?